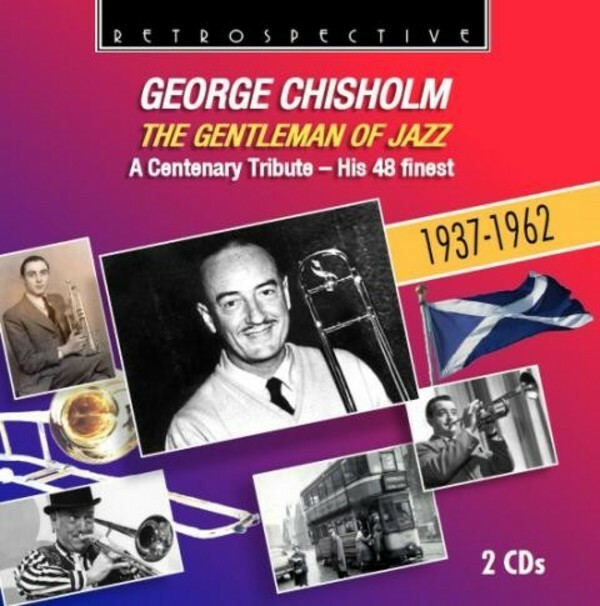 One month after saluting the artistry of Wilbur De Paris (Hot Mustard, RTS 4259), Retrospective presents another superb jazz release, this time celebrating the centenary of another great jazz trombonist � Britain�s finest ever � George Chisholm (1914-1997), the 'Gentleman of Jazz'. Many remember him primarily as a TV entertainer on such as The Black & White Minstrel Show, yet Europe has produced few jazz masters to rival him. Disc one (1937-1944) of our 2CD survey presents George from his very first studio session as a trombonist (with Gerry Moore in 1937), through his notable early dates with the likes of Benny Carter, Coleman Hawkins, Fats Waller and Danny Polo�s Swing Stars. Alongside his own 1938 Jive Five and 1944 Jive Eight recordings are some of the best from the many years he spent with the famous RAF band, The Squadronaires, plus a trio of surprisingly hot examples of Victor Silvester�s Jive Band. Disc two (1947-1962) shows how his style shifted in the 50s towards mainstream jazz, with eight fine numbers from his own 1956 group, as well as examples of his playing with Kenny Baker, Kenny Graham and others. But he never forsook �Trad�, and the disc also contains some delightful tracks with singers Denny Dennis, Michael Holliday and Clinton Ford. Throughout his life, George Chisholm brought happiness wherever he went. Happily we can still enjoy it. 21. What More Can I Say?